Should companies primarily serve the interests of shareholders, or are they responsible to a broader set of stakeholders, including their own workers? The financial crisis has exposed the deficits of the current regulatory framework for companies, as it prioritizes short-term shareholder value at the expense of the long-term interests of stakeholders. 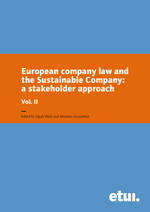 This book follows up on The Sustainable Company: a new approach to corporate governance (published by the ETUI in 2011 and edited by Vitols and Kluge), which outlined GOODCORP’s vision of an alternative to the shareholder value orientation of the current system of corporate governance.